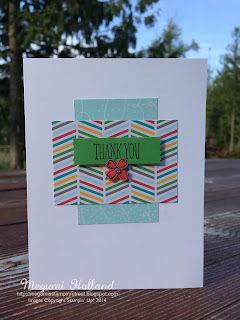 Here is a quick and easy thank you card I made using the new Cherry on Top Designer Series Paper Stack. It's so simple and cute! The little flower image and sentiment are from the Something to Say Stamp Set. 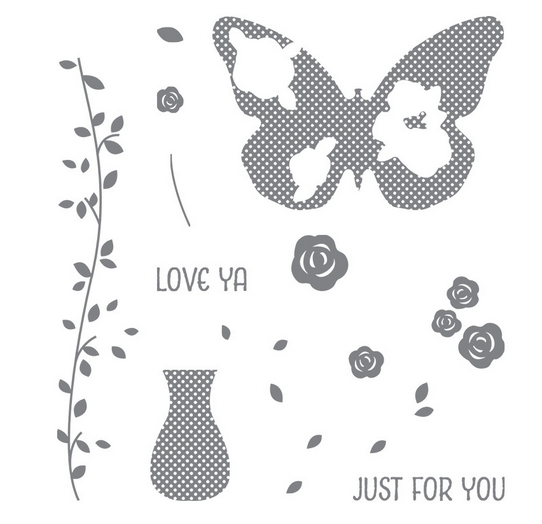 You can use the Itty Bitty Accents Punch Pack to easily punch out stamped images. Also check out the new Washi Label Punch!!! It's pretty cool!!! It's almost July but here is the winner of my Free Stamp Set offer for the month of May.... Thank you to everyone who placed a Stampin' Up! order with me in May. I drew one winner from all of the online and phone/email orders and the lucky stamper is ... Dawn G. from Sequim to receive Hello Love Stamp Set. Congratulations Dawn!!! The free stamp set for the month of June is Floral Wings from the new catalog. It's my favorite hostess exclusive stamp set featured in the new catalog. Take a look!!! Please click HERE to learn more about my Free Stamp Set offer. It could be YOU next!! !